A flow switch are flowmeter devices used to measure the flow rate and pressure of liquid, gas or vapour that passes through them. They measure flow rates over a set time, or they can continually measure the medium passed through. They operate by sending signals to another component elsewhere in the system (e.g. pumps) telling it to stop/start in order to adjust flow rate and pressure to the desired and programmed levels. Water: uses a paddle (physical or ultrasonic), for water pumps and sprinklers. Thermal dispersion: involves a sensor probe, allows the rate of gas or liquid flow to be calculated according to how quickly heat is carried away by the molecules flowing past. Oil: can operate at higher temperatures with robust seals and housing. Mechanical: need to be tested regularly as continual movements of parts will lead to wear and tear. PVC: basic type ideal where a quick visual confirmation of flow/no flow status is needed. Designed for cleaning and maintenance. Industrial: larger more robust so can withstand higher volumes, pressure and flow rates, designed for heavily contaminated or hazardous materials. Pneumatic: for applications where there is a necessary pressure differential between different areas of ducting. Rotary: functions as a basic turbine, ideal for low flow liquid monitoring. 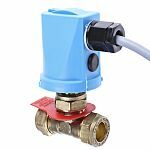 Each type of flow switch has its own specific applications and installation constraints. The way to select the right one is to think about the application as a guide, not the technology. Starting with the application, will help to select the technology based on accuracy, cost, durability and reliability, rather than trying to make the technology fit the application you have.